Our Happy Crafters Shine Heat Transfer Vinyl is a shiny, thin heat transfer vinyl that can be ironed onto any t-shirt, sweatshirt, blanket or other cotton or polyester-based fabric. Happy Face Shine htv has an ultra-metallic finish and stretches with the most stretchy fabrics. Looking for a vinyl for shirts, bags, pillow cases, and more that can be cut in your vinyl cutter and will help you stand out? Shine is exactly what you are looking for! This heat transfer vinyl is extremely thin and soft on your shirts. Even better, it will stretch and return with no damage to the design. 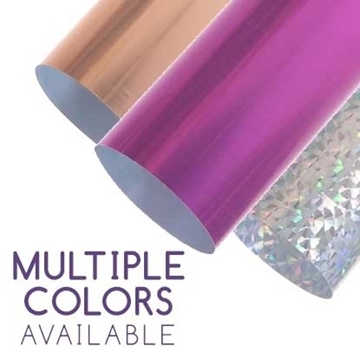 12" x 19" sheet of Happy Crafters Metallic Iron-On Vinyl designed for applications to cotton, polyester, and cotton/poly blends for a touch of shine. Quantity discounts listed below, and you can mix and match colors to get those prices!